"Extremism has no place in our schools," said Education Secretary Nicky Morgan. She was speaking the day before schools face new requirements to play a bigger part in counter-extremism. The Counter-Terrorism and Security Act places a legal duty on schools to "prevent people from being drawn into terrorism". But NUT leader Christine Blower said: "Teachers cannot be turned into spies in the classroom." Head teachers' leader Russell Hobby said schools should see the regulations in terms of "safeguarding" and not "surveillance". "Recent events have shown the risks of young people being targeted by radical groups should not be underestimated," said Mrs Morgan. Media captionHow ready are schools to play a role in tackling extremism? "Schools and childcare providers already play an important role in protecting and safeguarding young people including from radicalisation and extremism," said the education secretary. A telephone helpline has been offered for teachers, governors and other staff to raise concerns directly with the Department for Education. The regulations, being introduced on 1 July, set out new responsibilities for "frontline workers" in public bodies, including schools, to challenge extremism. 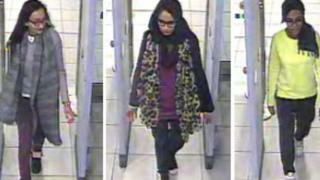 It follows high profile cases in which young people have left the UK to join militant groups in Syria and Iraq. The counter-extremism requirements, applying to primary and secondary, state and independent schools, include warnings against "non-violent extremism". "Being drawn into terrorism includes not just violent extremism but also non-violent extremism, which can create an atmosphere conducive to terrorism and can popularise views which terrorists exploit," says the government guidance for schools. Image caption Nicky Morgan says the risks posed by radical groups "should not be underestimated"
Teachers will have to assess the risk of pupils being drawn into extremist ideologies. There will be training for staff to identify children at risk and "to challenge extremist ideas". Schools will have to ensure that pupils do not access extremist material online. Mr Hobby, leader of the National Association of Head Teachers, said schools should "see their duties on radicalisation as another safeguarding duty". "Schools are used to keeping their students safe from harm and this is a version of that. This means looking out for students rather than conducting surveillance on them. "It means understanding the risk and acting proportionately. And it does mean reporting serious concerns so that any danger can be prevented before it materialises." But Christine Blower, leader of the National Union of Teachers, said the "jury is out" on whether such regulations are the best way to get young people to "reject engagement with groups who advocate violence". She said that the Prevent counter-extremism strategy was already causing "significant nervousness and confusion among teachers". Ms Blower warned that concerns over extremism could "close down" the classroom debates which could encourage democracy and human rights. The regulations set out a definition of extremism as "vocal or active opposition to fundamental British values, including democracy, the rule of law, individual liberty and mutual respect and tolerance of different faiths and beliefs". There are two sets of guidelines - one for England and Wales and another for Scotland.